Review: 7.2 out of 10 stars. This is a tribute to Tom Clancy and the movie is not based on any of his books and is only loosely based on how his character Jack Ryan, Sr. first became a CIA agent. Obviously due to the limited amount of time of a movie (this one only 1:45) it had to be shorter, direct and filled with actions. Don’t be fooled by those speculated reports about how bad this movie could be simply because it was delayed from Christmas. 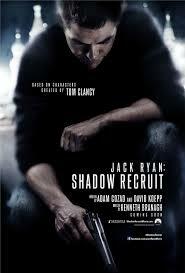 True it’s no Oscar movie but definitely some good action and chase scenes. The story surrounded when Jack Ryan (Pine) was injured from the war (same as book but from a different war), and while in rehabilitation, he met Cathay (Knightley.) This is totally different from any of Clancy’s books. Story went as he was an undercover until he was sent to Russia to deal with Russian mafia Viktor Cherevin (Branagh) when everyone in America involved was in danger. Pine did okay and Costner’s role was sad. However, Branagh had the best acting overall. He’s the bad guy you want to love and feel bad at the end. The movie was played at an IMAX screen and the deafening sound made the actions more realistic. They could use a lesser known actress than Knightley as she barely had any lines in the movie and in 1 scene, she had to act impatiently just to try to deliver 1 line. Well, she acted impatiently. She literally served as a decorating vase in the movie, which was close to the book, but a waste to such a good actress. The story was a bit slow in the beginning, good pace in the middle, then seemed a bit rush in the end with a slightly trivial ending. Because it’s not based on the series, the storyline was much less complex but the good thing is you will not know how the story went because there are no books to compare with. But it does make the books a bit more interesting. This movie is almost like an adaptation of The Hunt for Red October such as he injured his back in the book, but his leg in both Hunt and this movie. He was not recruited to be a secret agent right from the beginning of his investment analyst career. He already made a name of himself before he turned to CIA work. He did not meet Cathay during rehabilitation. The brief 9/11 footage that led Ryan to skip his final thesis and joined the Marines was a cheap take. Note Jack Ryan is born in 1950 and this created some confusion since that’s how Jack Ryan, Jr. started his CIA career instead. This combination of 2 characters is a weak idea.